The transformation of the beer scene in Australia over the past few years appears to be even more evident in the pubs and bars of Melbourne than it is in the bottle shops. Even the most resolutely conventional pub seemingly offers at least some small concession to new wave brewing, if not necessarily to micro brews and brewers. 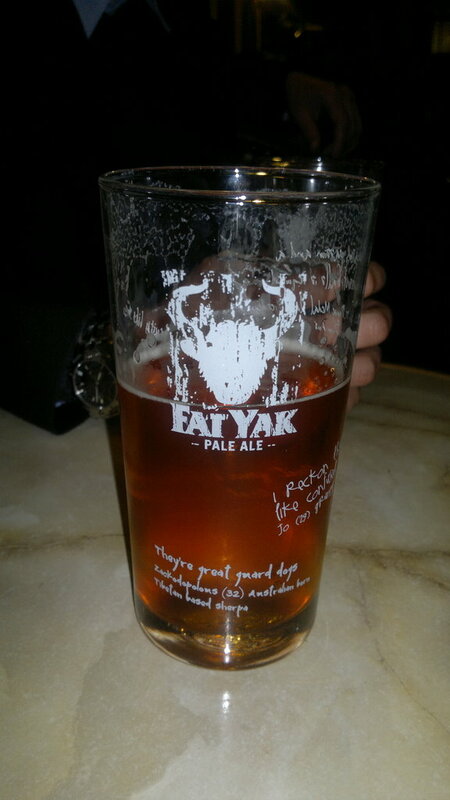 This often takes the form of Matilda Bay Brewing Co’s recently-introduced, American-syle Fat Yak Pale Ale (4.7%, actually owned by Fosters) and Coopers Brewery’s straw-coloured Pale Ale (4.5%, not actually a newcomer but perhaps the brewery that inspired the Australian beer renaissance). Both beers were available widely, including at my Melbourne colleagues’ “local”, the Mitre Tavern on Bank Place off Little Collins Street. 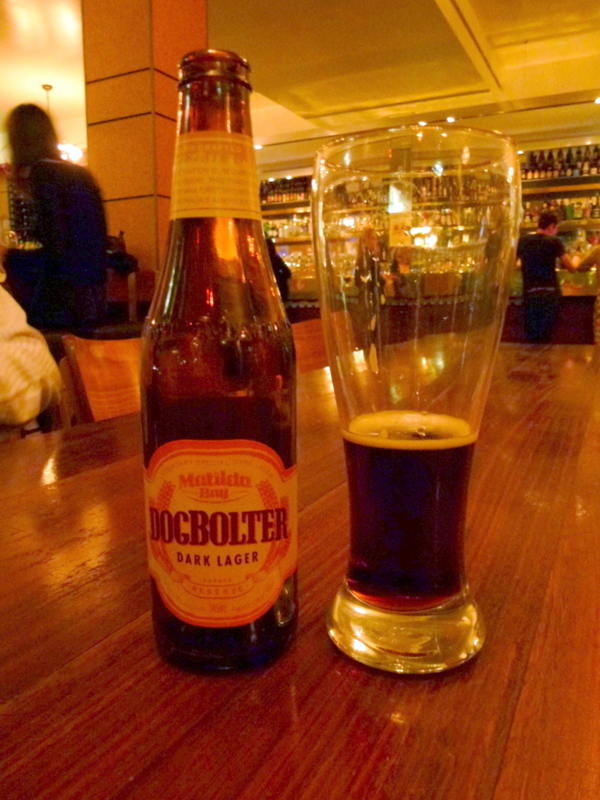 Neither really stands out, especially when served cold (which is seemingly most of the time), but both were preferable to old school local brews such as Carlton Draught and Victoria Bitter (VB). What was less palatable, especially given the undemanding nature of these brews, was the cost of a beer in Australia nowadays, which was not far behind the £10 per pint I’d paid in Japan, £8-9 being fairly normal. A strong Australian dollar and weak pound sterling have conspired with the (typically) higher cost of small scale brews and a federal government policy to increase alcohol taxes (since the last time I was down under) to make the country a more expensive place to drink out even than Scandinavia! Still, an unexpected positive resulting from the high price of pub-going in Australia right now is that it encourages drinking in smaller measures. Which indirectly leads to sampling a greater variety of brews. Which I guess better suited my aims. 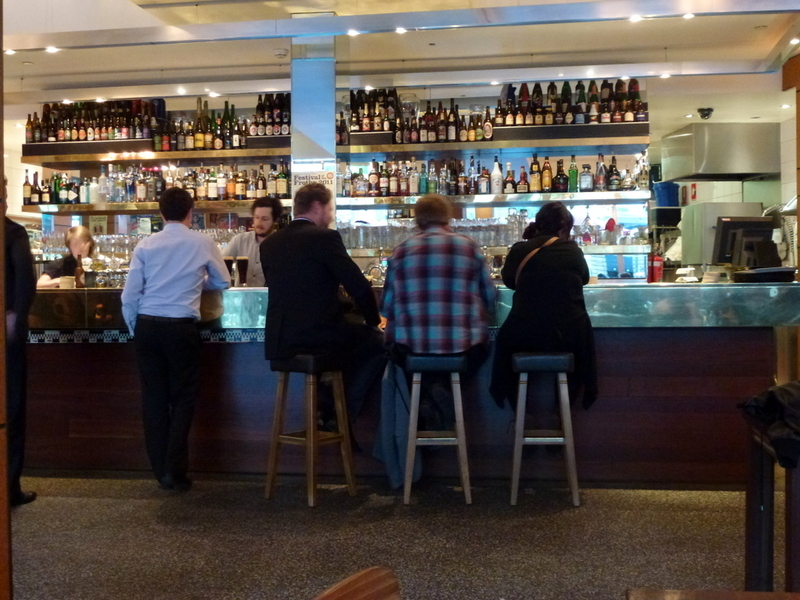 My first encounter with a specialist Australian beer bar came in the shape of Beer DeLuxe. Situated in Federation Square, an early 2000s-constructed civic centre and cultural complex across the road from Melbourne’s Flinders Street main railway station, Beer DeLuxe offers a modern but comfortable setting for sampling a multitude of beers from home and abroad. And a very decent selection there was too. Unfortunately, as I discovered, the broad choice may in some ways work against the drinker’s best interests. The unremembered and unremarkable Märzen that opened the evening’s sampling lacked aftertaste, if not colour. This left it a shadow (if not literally a pale one) of the German original, lacking both the juicy malt and the sustained if not overly heavy hopping it would need to counterbalance it. While it would be unrealistic to expect every beer sampled to meet or exceed expectations, rather surprisingly this lack of aftertaste continued into our next beer, a brew in a style that can normally be counted on to leave a long impression. The essential character of the brew again pointed to an good appreciation of the science of zymurgy if less to the art of brewing and dispense. Maybe it was the slightly-cooler-than-strictly-necessary serving temperature that stymied the exuberance of both draughts. Or perhaps decades of suppressing bitterness has had an unconscious effect on new brewers. Whatever, this is something I feel new Australian brewers and quality beer outlets may need to work on, even if the problem clearly doesn’t afflict every draught brew on offer. A case in point was Moo Brew Stout (8%), an apparently barrel-aged imperial stout from the Moo Brew brewing outgrowth of the Moorilla winery in Berriedale, Tasmania. This offered a velvety licorice, dark chocolate and vanilla palate with a bitter, charred raisin aftertaste as it warmed in the glass. This greater aftertaste might also be a byproduct of its alcoholic strength (which was much greater than I was really looking for due either to unclear labelling or tired eyes), which often helps overcome the effects of overzealous chilling. Either way, there was no doubting the quality of this one, even though I’m currently in a period where I’m struggling to love strong stouts. Moo Brew Stout will also be forever etched on my mind (or is that my mental accounting slate?) for probably the single most expensive round of three beers I’ve ever procured – $36 (about £24) for three schooners (425ml glasses)! Both Tim and Matt (an old work colleague and friend of both Tim and myself, now also back in Melbourne) later suggested that Moo Brew is known for being a tad expensive even by Australian micro standards but that’s perhaps understandable given the nature of the beast. Overall, quite an experience. Unfortunately Beer DeLuxe also left me with perhaps my main beery disappointment during my visit. An opportunity to expose my Aussie chums to the delights of Bavarian dark lagers in the shape of the generally excellent König Ludwig Dunkel backfired badly when the skunky, vegetal taste led me to investigate the “mindestens haltbar bis” on the label. The bottles were some 10 months past their best by date. This is often a disaster for German beers, which are frequently unpasteurised but lack the bottle-conditioning that seems to help many unpasteurised British brews last longer in bottle. Certainly, the shelf life of many German bottled beers can be very short. It would be wrong to suggest that poor inventory management is an inevitable result of prioritising the number of beers on offer above quality (although I’ve seen that happen in the UK and elsewhere before) – and the helpful bar staff exchanged the beers without question – but it would be a shame if the spirit of adventure shown by Australia’s new breed of beer enthusiast wasn’t balanced by a similar commitment to quality of delivery. Thankfully a worthwhile replacement was found in the shape of bottles of Matilda Bay’s Dogbolter, presumably named after the infamous beer once made by Firkin brewpubs in the UK. 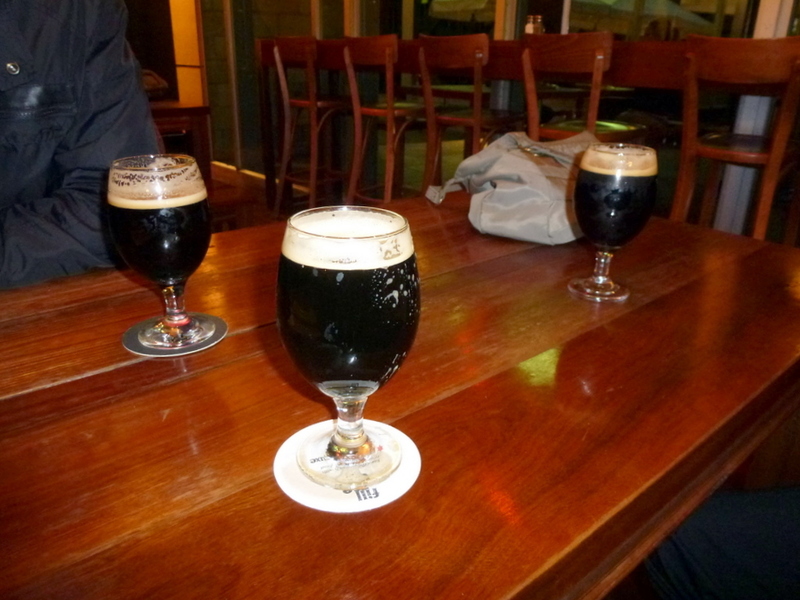 Where David Bruce’s beer was something like a strong mild ale in style, its Australian namesake is clearly a dark lager. And not a bad one either considering it gave a good account of itself following on from the rather expressive Moo Brew. It also has staying power, being one of the few revivalist beers I also tried last time I was in town, in 1998. 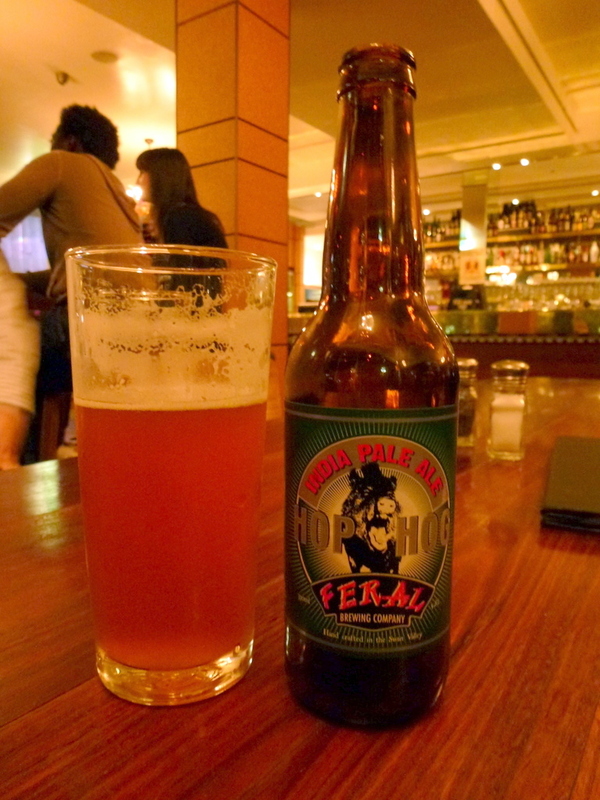 The evening was finally capped off with a bottle of Feral Brewing Co’s Hop Hog IPA (5.8%), a distinctly American take on India pale ale that would undoubtedly be regarded as a “single” IPA in the States nowadays, where extreme is now the norm. Remarkably, Feral Brewing also produces a brew in the salty and sour Gose style of wheat beer native to Leipzig in eastern Germany, a style that has so far eluded me, as well as other oddities. The brewery is in Baskerville, Western Australia. The small faux pas of the German bottles aside, Beer DeLuxe is more than worthy of inclusion on the itinerary of any beer enthusiast’s visit to Melbourne and would be a good first base for a short pub crawl. My next entry looks at some other establishments you might want to add to such a tour.